Are you tired of walking around with flabby, jiggly, arm fat? This problem bothers millions of women and it can be caused by many factors such as rapid weight loss and weight gain, hormonal changes, poor eating habits and a sedentary lifestyle. Most women start experiencing this problem around age thirty-five, but it can appear earlier especially if there is extra fat involved. This problem does not cause any health risks, but women want to deal with it because they cannot wear certain types of clothes such as t-shirts, tops, summer dresses and swimsuits. Fortunately, this problem can be solved by balancing your diet with healthy products and performing special workout routines. We would like to show you these six exercises that help tone and firm your arms. Do these moves regularly and you will get the arms which you have always dreamed about! This arm workout consists of effective moves such as tricep push-ups, chest push-ups, bicep curls, dips, tricep extensions and lateral shoulder raises. These exercises focuses on strengthening your upper body and toning flabby arms. You should perform three sets of twelve repetitions of each exercise. In order to get the desired results you should perform this training routine three-four times a week. Do you want to have beautiful strong arms? Do these exercise regularly and obtain a perfect body shape. Remember that you won't be seeing immediate results. Sculpting strong and beautiful arms is long, hard and persistent work. Are you ready to try? Scroll down to see the instructions in order to avoid injuries. 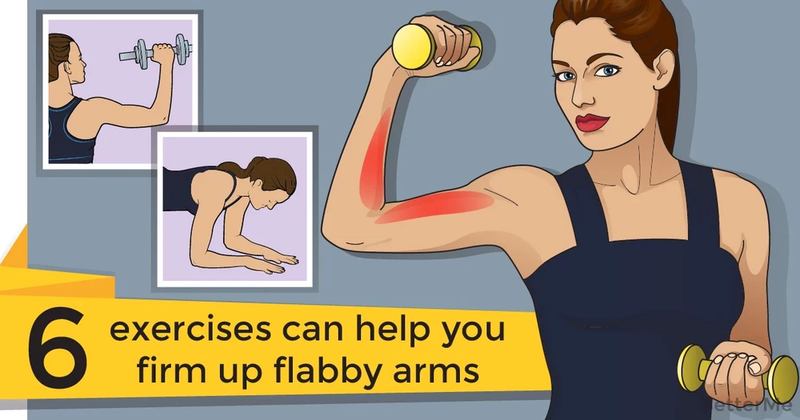 It is time to get rid of flabby arms!